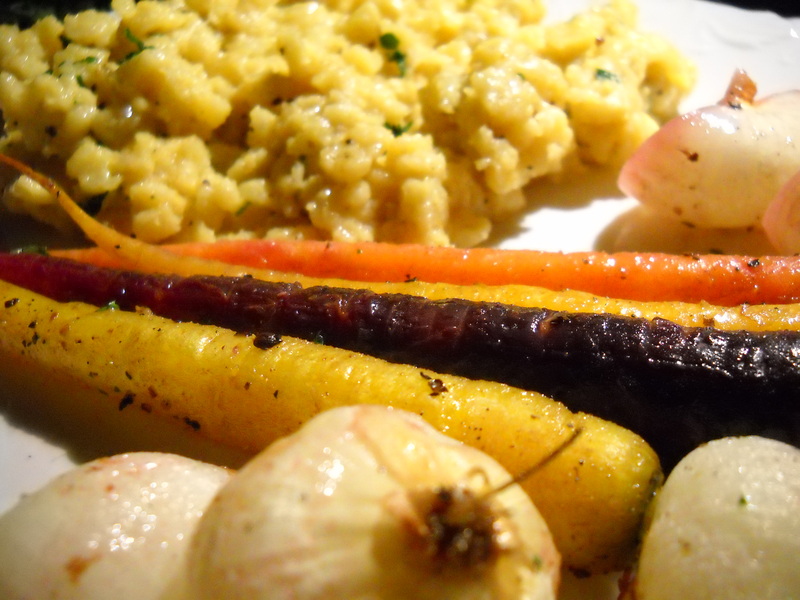 Vegan Spaetzle w/ Roasted Heirloom Carrots & Cippolini Onions. I bought a spaetzle maker ages ago. Did I ever get around to using it? Nah. Yesterday, I was lying in bed sick and watching Food Network. Nice to know that whatever is plaguing me is not affecting my appetite….sigh. Anyhow, Guy Fieri was on and I don’t mean Diners, Drive-In’s and Dives. It was some other old show of his. He had some kind of German theme going on and was making schnitzel, spaetzle and veggies. Well, dude inspired me to finally use my spaetzle maker to make some damn spaetzle. I thought the roasted veggies sounded amazing as well, so I picked up some heirloom carrots and cippolini onions to get the job done. I ended up having a really delicious meal despite my being a sick mess. Bring a medium to large size pot of vegetable broth to a boil. 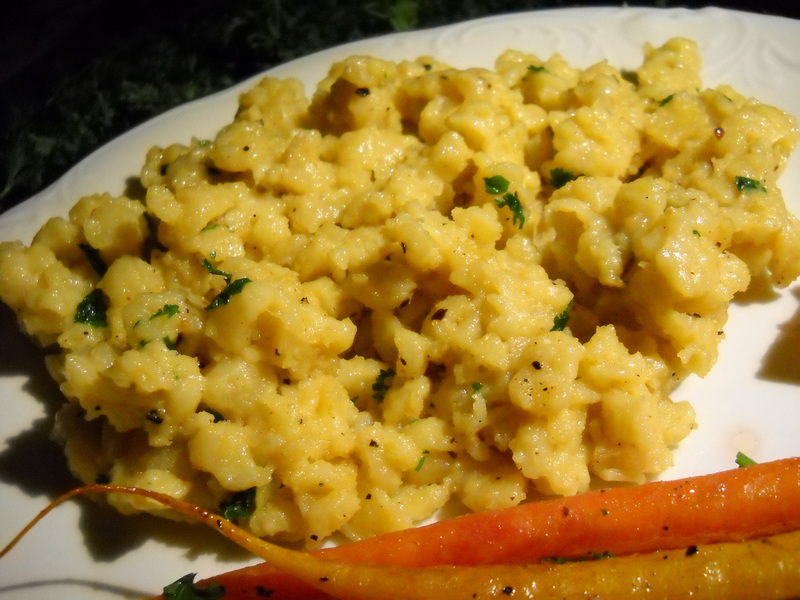 While the broth is heating up, make the spaetzle. Combine all of the dry ingredients. Then cut in the Earthy B with a pastry whisk as if you were making any other kind of pastry dough. Then add the water. The dough should be moderately stiff. Now, to make the spaetzle you will need a spaetzle maker or potato ricer to push the dough through. Grab whichever one of those tools you have and begin to push the dough through into the boiling broth. I had to do mine in batches, so don’t overcrowd your pot. The spaetzle are done cooking when they float to the top of your broth. Make sure to take a strainer and remove them, as they are pretty yucky and gummy when overcooked. Add a really small amount of Earthy B or oil to the spaetzle once they are out of the pot to keep them from becoming one large mass. Roasted Heirloom Carrots & Cippolini Onions. Preheat oven to 400°F. Place carrots (whole) on a baking sheet. Add the onions. If some of your cippolinis are big, cut them in half. Add remaining ingredients except for the parsley. Roast veggies in the oven for about 30 minutes or until tender. Serve beside your spaetzle and begin feasting. ← Oyster Mushroom Po Boys & White Chocolate Raspberry Sage Tart.